Although you can add, subtract, and intersect selections in Photoshop Elements 11 by using the Shift and Alt keys (Option key on the Mac) and the selection option buttons in the Tool Options, you can do even more with the commands on the Select menu. The All and Deselect commands are self-explanatory. To select everything in an image or, if it has layers, everything in the chosen layer, choose Select→All or press Ctrl+A (Command+A on the Mac). 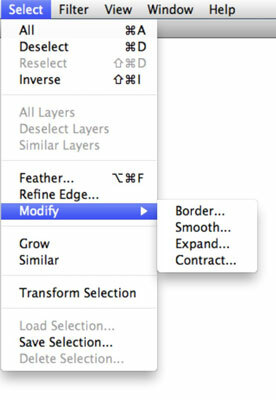 To deselect everything, choose Select→Deselect, Ctrl+D (Command+D on the Mac). You rarely have to use All. If you don’t have a selection border in the image, Elements assumes that you want to apply whatever command you execute to the entire image (or layer). If you’ve taken some valuable time to carefully lasso a spiky iguana from its perch on a mangrove tree, the last thing you want is to lose your hard-earned selection border. But that’s what happens if you inadvertently click the image when you have an active selection border — it disappears. Yes, technically, you can choose Edit→Undo if you catch your error right away. And, you can access the History panel to recover your selection. But a much easier solution is to choose Select→Reselect, which retrieves your last selection. The Reselect command works for only the last selection you made, so don’t plan to reselect a selection you made last Wednesday — or even two minutes ago — if you’ve selected something else after that selection. Sometimes, selecting what you don’t want is easier than selecting what you do want. 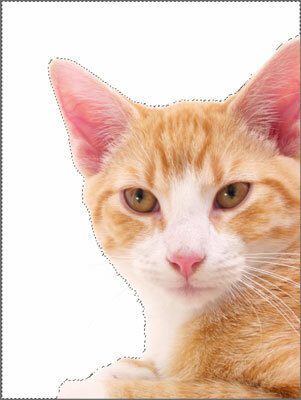 For example, if you’re trying to select your cat Princess, photographed against a neutral background, why spend valuable time meticulously selecting her with the Lasso tool when you can just click the background with the Magic Wand tool? After you select the background, just choose Select→Inverse. Voilà. Princess is selected and obediently awaiting your next command.